Philadelphia, Pennsylvania:: Luminice Press,, 2019.. Deluxe Edition of 3. Wood case: 8.5" diameter x 2.5" high. 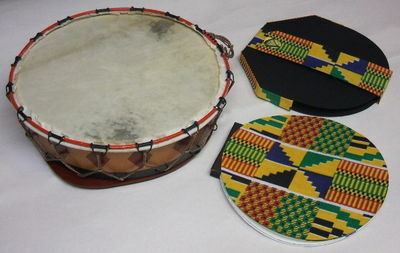 Working African style drum: formed wood shell with goat skin drum head; wire rings with cord lacing for tuning; painted with enamel; hinged bottom cover. Book: 7" diameter; in slipcase with closure (7.25" x 7.25" x .62"); 6 gravures from original drawings by the artist, 5 mounted as volvelles; handset letterpress text; wax-printed African cloth covers. Signed and numbered by the artist. Concept, design, illustrations, binding, drum fabrication and printing by Thomas Parker Williams. Concept, text, hand typesetting and printing by Mary Agnes Williams. Below is an illustration of how the drum case was constructed. First, thin plywood was soaked in water and bent around a form. Then the four sections were glued together. Tuning rings were formed from wire and soldered. The goatskin head was soaked and formed around the interior ring. The exterior ring has eyelets soldered to it to pass the tuning cord through it as well as the eyelets on the bottom of the drum. The drum is then tuned in the African way by pulling the cords tight. Book - 7" diameter; in slipcase with closure, 7.25" x 7.25" x .62"
Images - 6 gravures from original drawings by the artist, 5 mounted as volvelles; hand-set letterpress text; wax-printed African cloth covers. Mary Agnes Williams - Concept, text, hand typesetting and printing Thomas Parker Williams: "Africa's Children is a personal view about music, based on the rhythms of the drum, that evolved from the African diaspora. Blues, Jazz and Funk are American forms; the music of Cuba combines African and Spanish roots." Drum construction: "First, thin plywood was soaked in water and bent around a form. Then the four sections were glued together. Tuning rings were formed from wire and soldered. The goatskin head was soaked and formed around the interior ring. The exterior ring has eyelets soldered to it to pass the tuning cord through it as well as the eyelets on the bottom of the drum. The drum is then tuned in the African way by pulling the cords tight."